The concept of profit sharing among Fiji Airways staff has been motivating them to go the extra mile, say cabin crew serving the Nadi-Hong Kong route. The national carrier, in April this year, announced the airline’s staff and management would earn over $1.25 million in profit-share and bonuses as a result of the 2013 financial performance. And with whispers of the 2014 profit maybe being a record the cabin crew realise this means a bigger share would be coming their way next year. 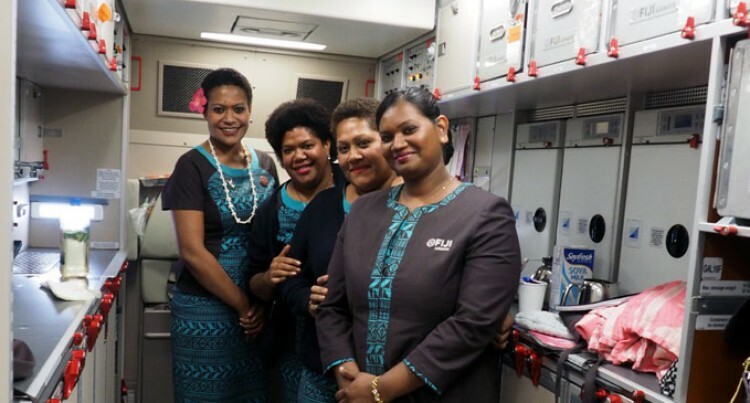 Ateshma Vikashni and Lusiana Serevi have been with Fiji Airways for eight years while Makereta Naulaga and Bale Smith have been with the national carrier for 10 years. Speaking to the Fiji Sun onboard flight FJ391 from Nadi to Hong Kong last week, the four described how they stuck by the company through its highs and lows. Ms Smith said it felt good knowing their hard work was being recognised and they were being rewarded for it. “There was a lot of hesitation when this whole idea of profit sharing was first discussed but it has worked out very well in the favour of employees,” she said. “Often we are forgotten when corporates make their profit but now knowing that we have a piece of the pie as well is really motivating people to work harder. “It is like we have taken ownership of the company and we know that our every action will in one way or the other affect the airline. The four explained that under some previous management all their perks and bonuses had been cut off. “Part of the drive now is to work extra hard. Our quarterly KPIs take into account all sorts of things such as on time performance etc,” Ms Serevi said. The cabin crew also had kind words for their outgoing managing director/chief executive, Stefan Pichler. “He knows how to deal with his staff. He changed the face of this airline and he will be sorely missed by us all,” one said. The significant increase in profit expected for this year is also testimony of the extra hard work that has been put in across the board at the national carrier.